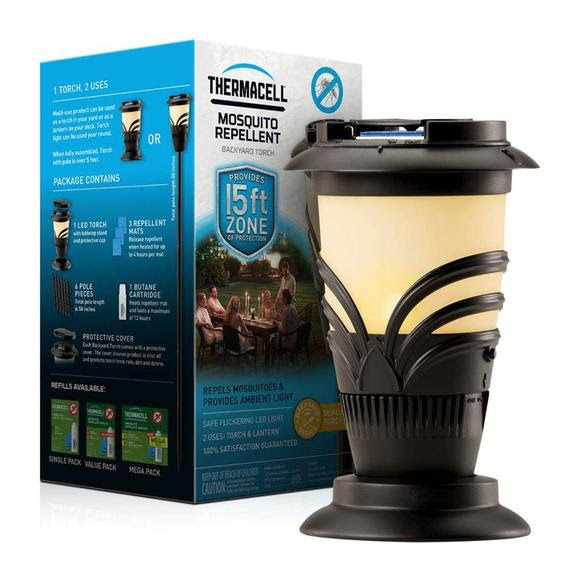 Thermacell's Mosquito Repeller Lexington Torch effectively repels mosquitoes, black flies, and other biting insects by creating a 15 x 15-foot zone of protection for bug-free comfort. Its ambient light and decorative, flickering design perfectly complement any deck or patio, and its flameless light source makes it safe for active backyards. Thermacell&apos;s Mosquito Repeller Lexington Torch effectively repels mosquitoes, black flies, and other biting insects by creating a 15 x 15-foot zone of protection for bug-free comfort. Its ambient light and decorative, flickering design perfectly complement any deck or patio, and its flameless light source makes it safe for active backyards. Ideal for use while gardening, grilling, and hanging around the backyard, the Thermacell Lexington Torch has been evaluated by the EPA for safety and effectiveness.